alaTest has collected and analyzed 332 reviews of Hamilton Beach 40616. The average rating for this product is 3.8/5, compared to an average rating of 4.4/5 for other products in the same category for all reviews. People really like the price and performance. The durability and maintenance are also appreciated, but some have doubts about the noise. We analyzed user and expert ratings, product age and more factors. Compared to other products in the same category the Hamilton Beach 40616 is awarded an overall alaScore™ of 82/100 = Very good quality. I use this product several times a day. 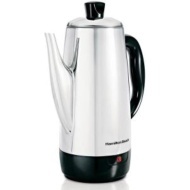 The percolator makes really good hot cups of coffee. It would be foolish for any of us to pretend that the small appliances we are seeing come from China will hold a candle to those of a generation ago. We pay the price in quality for our much cheaper small appliances--in real Dollars, that is.